Business owners have to make sure that their employees and managers follow the rules and regulations that were set to ensure both stability and order. 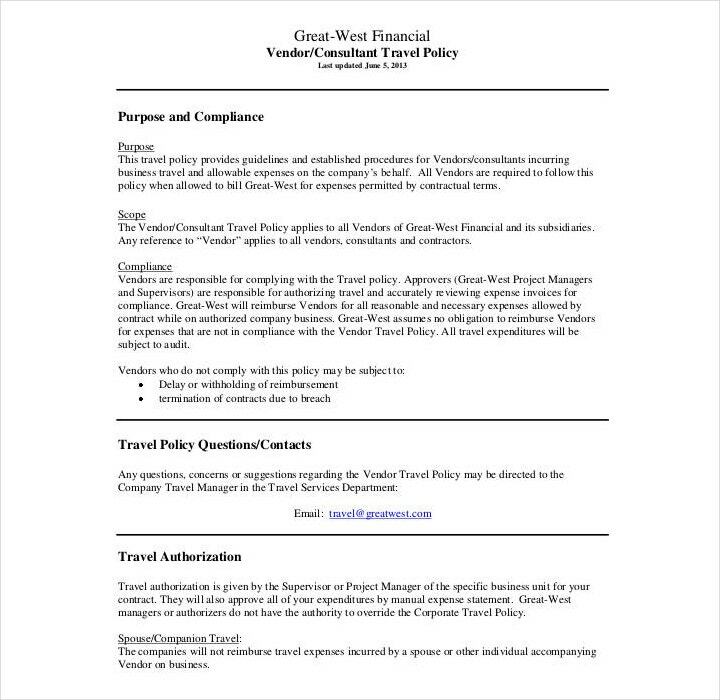 So it’s important that these employees and managers are given information regarding policies and procedures from the very moment they start working for the company. Eventually, there will be moments when these policies and procedures might need to undergo certain changes. There might even be times where new ones need to be added and implemented. 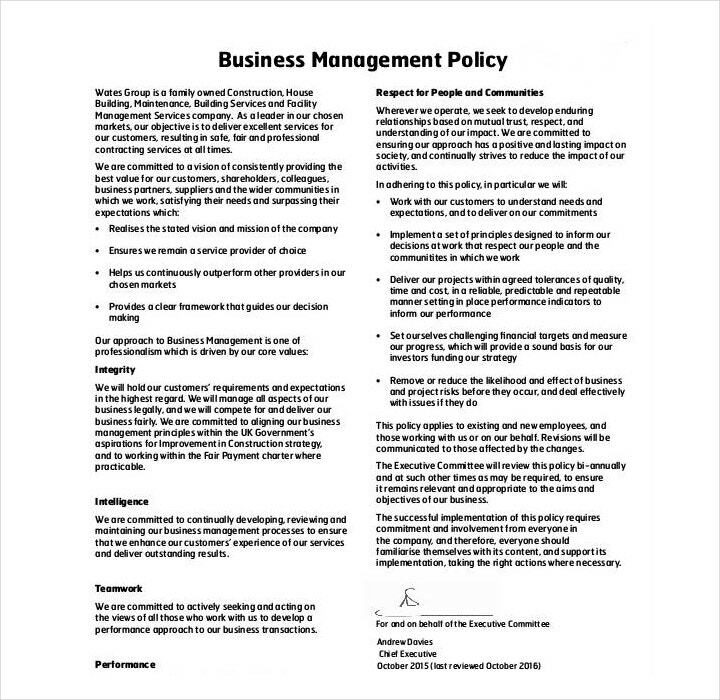 So to help with this, business owners can make use of policy template formats to ensure that they’re able to make the company policies that they need to run a successful business. What is a training policy? Give broad directions when it comes to training activities. Provide the training outline on the kind of authority the training department has, as well as its limits. A company’s training policy can also be used as one of the tools that can evaluate the success of the company’s efforts. Basically, it should answer the question regarding whether or not your policy is helping your company meet the smart goals it needs to fulfill in order to become successful. A social media policy is what outlines the rules and regulations regarding how employees should behave when it comes to handling anything on social media that’s related to the company. With a good social media policy, business owners can ensure that their brand is protected online by having their employees know of the potential threats, how to avoid them, and how to act in the event of an attack. So whether it’s a business that’s just starting out in creating an online presence or a business that has already established its online presence, every organization will need a social media policy to ensure that their online reputation isn’t damaged. It can help protect your company’s reputation. By clearly explaining to your employees how they should represent your company, you’ll be able to mitigate any potential threat to your brand. To further help in this regard, a good social media policy can also explain what actions the employee should need to take in the event that he or she has made a mistake online or when the company is being attacked online by hackers or even trolls. It can help defend against any legal troubles as well as security risks. Social media policies can help safeguard your company from any potential legal troubles or even security risks by outlining them and showing the ways to avoid them. Your policy must also show employees what they must do in the event that they accidentally put the company’s reputation at risk, or in the event that they fall victim to any form of malicious attack online. It can empower employees to share company messaging. Social media policies can help amplify your company’s brand. One of the best ways to do that is by making use of your employees. With clear guidelines, companies can help ensure that their employees understand how to use social media to promote the brand. By having employees share company messaging that has already been pre-approved, then this can definitely help in reducing the risks to your company and ensure that all the shared information is accurate and on-brand. The first step would be to gather your team. A social media policy cannot just be written by one person alone. A company’s social media policy must be unique and ideally should have input from many different people involved with the company that has a variety of skill sets. By making the social media policy through a team approach, you’ll be able to ensure that the key areas of risks have been properly covered as well as ensure that all future challenges that could arise will be properly handled. You don’t have to worry about having every member of your staff know the details of your social media activities. All you have to do is know the kind of information your staff needs to have in order to respond appropriately on social media should a crisis occur. Social media changes every day. If your company’s social media policy is narrowly focused on a particular social media website, then you can bet that it’s going to be out of date really quickly. When writing your policy, it should focus on the bigger picture. Basically, who does what, a general overview what these people are supposed to do, and why these people are doing the job that they are tasked with? It’s possible that you already have many internal policies when it comes to social media activities. These should include privacy, photo consent, Internet usage, cell phone usage, and much more. You can reference all of these in your social media policy. All you have to do is take note of any differences in the application that may be necessary for social media. This will help you make a policy that should cover just about everything regarding how an employee should behave online through different methods. There are a lot of regulations such as HIPAA that are in effect both online and offline. 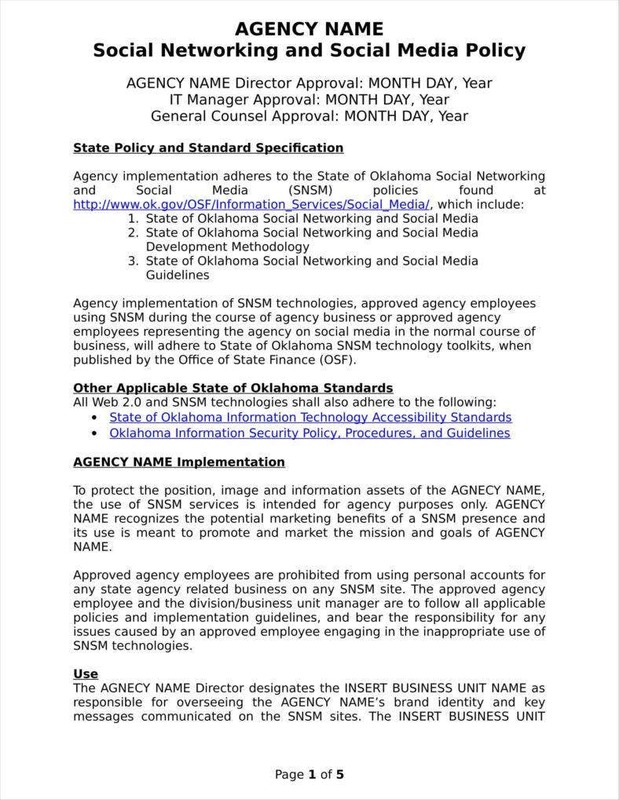 You’re going to have to use your social media policy to remind your employees that these regulations must be adhered to. If possible, lay out explicit types of behavior that you will not tolerate. 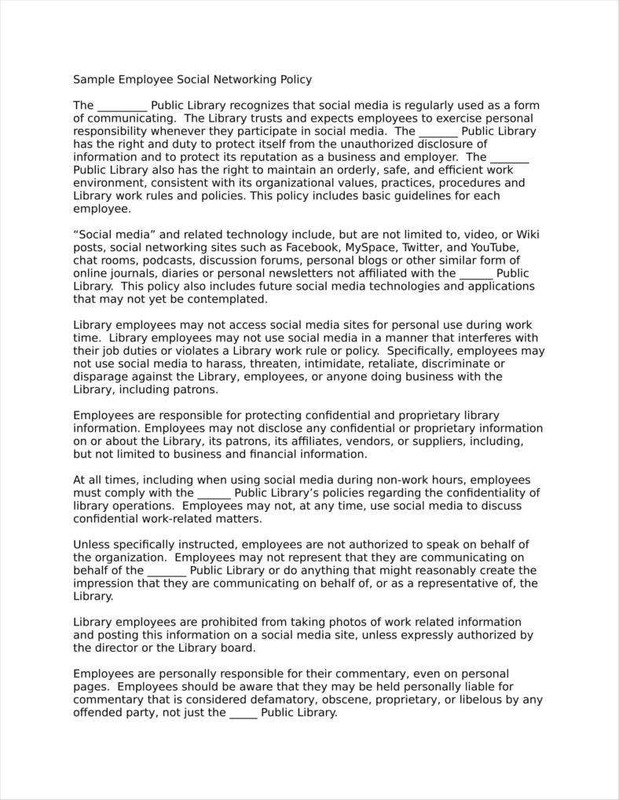 Doing this will ensure that your employees think twice before posting whatever information about the company that they would like to share with the public. It’s best that you create two social media policies for your company. The first one should be for your employees using social media for their job and the second one for how your employees use social media in their personal lives. The first policy should be more focused on job-related activities such as articulating the roles and responsibilities or what internal and external policies that the employee must comply with. 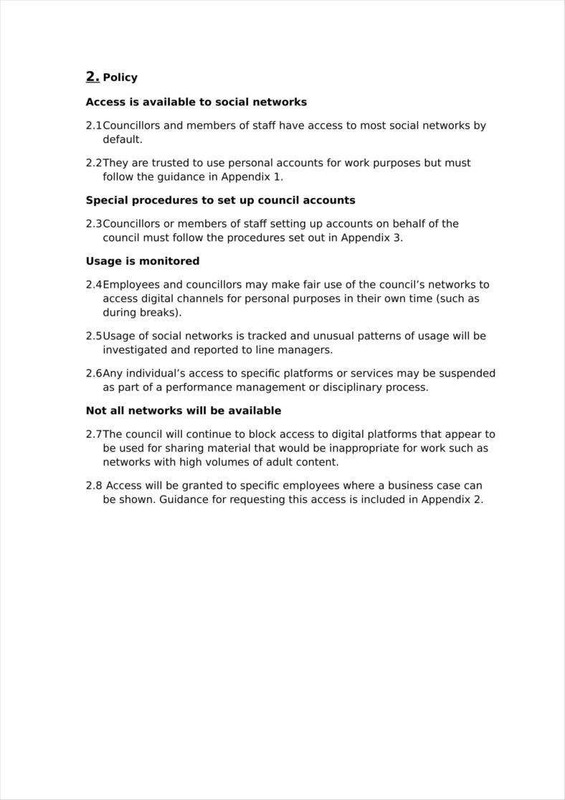 The second policy mostly focuses on what your employees can and cannot say online regarding your business. There are some organizations such as those involved with the military or health care that will want to be very specific about what their employees can share online. The policy should be able to educate your employees so that they don’t become ignorant with regard to the types of threats that could potentially cause problems for the company. So your policy should be able to provide job-related training to your staff who are engaged in social media on your company’s behalf. It should be able to educate your staff on Internet safety which includes how to protect themselves from cyber-crime as well as how to establish and protect your company’s online reputation. Ask a lawyer to review your policy. Legal advice is critical. It’s easy to create mishaps, especially when it comes to areas of labor relations. Make sure that the lawyer you’re asking for help is someone that’s experienced in that area. However, you have to remember that legal advice will never come cheap. So if you’re going to do this, then you’re going to have to shell out some money to ensure that your policy is one that covers the important areas of your business that should protect it from any malicious attacks or even threats from within your company. Make sure that your social media policy is reviewed at least every six months. 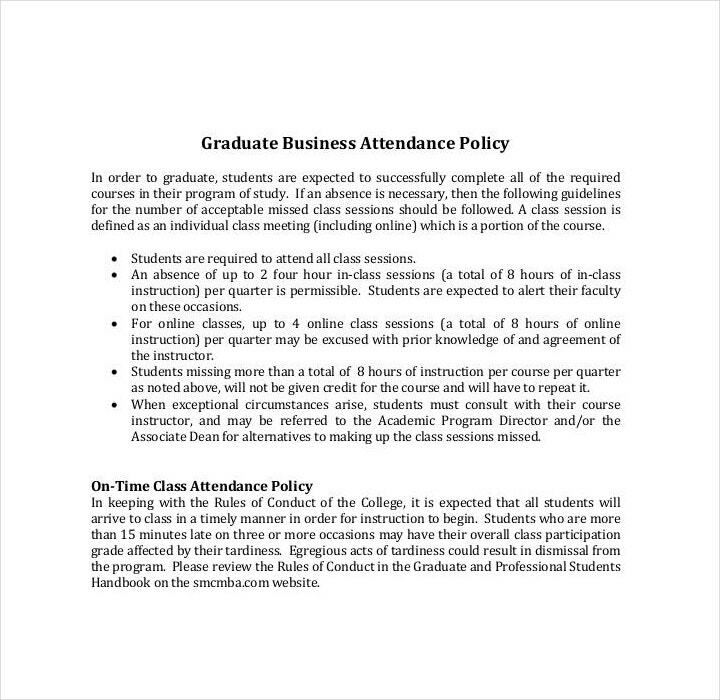 Allow everyone to review the policy separately and together. What is a return policy? With a proper return policy, you’ll be able to reduce the time and money it takes to process returns made by customers. It can also minimize the number of returns your company receives as well as ensure that your customers keep coming back to do business with you. Having this policy will definitely inspire confidence in buyers so that they won’t be hesitant when it comes to purchasing products from your business. Even if the customer isn’t fully satisfied with the return, being able to handle the return professionally can ensure that these customers will come back to do business with your company. People tend to return products if they’re disappointed with them. You’ll have to minimize the customer’s disappointment by creating product descriptions and providing proper product photos. If customers can better understand the product they’re buying, as well as view proper pictures that will shed new light on the product’s design, then you’ll greatly be able to reduce the number of returns. Use plain English when writing the return policy. You shouldn’t go crazy with all the legal jargon. Using legal language that can only be deciphered through legal counsel will just end up confusing your customers. Make sure that you use terms that everyone can easily understand as well as make sure that your employees are able to follow your policy to the letter. You have to remember that all sales are not final. You shouldn’t make it difficult for your customer to go through the return process even if the customer isn’t particularly happy with the product that he or she bought from your business. The product’s condition will also determine whether the customer will get a full-refund, partial-refund, exchange, or even no refund at all. Make sure that your return policy is easy to find. Customers will greatly appreciate it if they know where to look when it comes to finding your return policy. So it’s best that you post your return policy on your business’ website, on customer correspondence, on receipts, or even on product packages so that the customer has every opportunity to go over your company’s return policy. There should be no hidden return costs. Nothing is worse than being surprised by unexpected costs. Make sure that you don’t hide anything and make it really clear in the event that the customer has to pay for things such as return shipping. It’s normal to have time limitations when it comes to accepting customer returns. You certainly don’t want to accept any form of return a year later after a purchase. So it’s important that your return policy is able to define how long it takes for the customer to make up his or her mind. Tell your customer that he or she has at least 30, 60, or 90 days after the purchase. Also, your policy should have a separate time frame when it comes to damaged or even malfunctioning products. 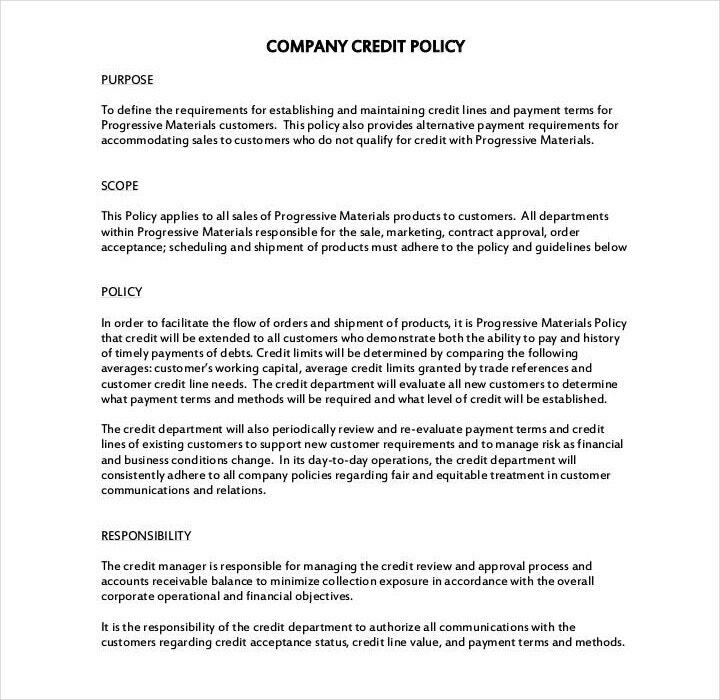 If a customer wishes for a return, then your policy is going to have to state whether the customer is going to get a store credit, exchange the item, or even a cash return. Every company has their own preference, and you should choose the best one that suits your business. So in the event that the customer wishes to return a damaged or malfunctioning product, the customer shouldn’t be expected to pay for any extra costs. You’ll have to put all of your efforts into replacing the item, or you can give the customer a full refund without him or her incurring any kind of cost. You have to train your staff to be knowledgeable enough when it comes to your business’ return policies and procedures. By properly learning the best ways to serve customer returns, this can only lead to the company’s success. If your customer is trying to claim the product as damaged, the first thing that you’re going to have to do is to see whether everything is where it should be. This is especially true if the product is something that the customer assembled. So go through the product thoroughly before deeming the product as damaged. Make a list of the goals of your company. If you’re a business owner or the manager, then you should know all about the best goals that your company should achieve. You’ll have to consider things such as sales goals, goals focused on employee and management, and goals based on where you would like to see your business in the future. Not only will you have to make these goals as specific as possible, you have to ensure that they’re also attainable. If these goals are things that your employees can never hope to achieve, then you’ll find that there will be a big drop in both employee performance and productivity. After you’ve set these goals, you have to make sure you and your employees commit to them. Write down a list of all the company’s tasks and procedures. Go through all of the day-to-day activities that happen within your business. You’re going to have to write down each task that would need to be done each day so that the business can continue to run smoothly. You’ll have to consider things like what tasks will need formal outlines and directions, which procedures need to be done consistently, and what tasks won’t need much instruction. Create a list of all the problems and all of their potential solutions. The point of the policies exists to ensure that the business is able to operate in an orderly manner, as well as make sure that employees continue to live up to company expectations. So what you’re going to have to do is think about all of the problems that could surface if there were no rules, and from there you may come up with the policies that your company needs. After you’ve thought of these issues, come up with the brief issues as to how you’re going to have to solve them. Think of the issues that surround the day-to-day activities of your business. 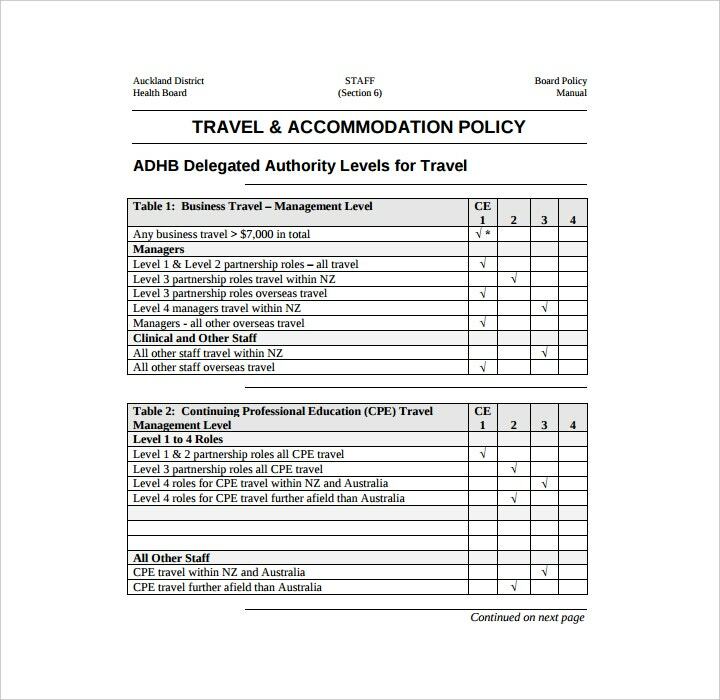 Make a list of the different categories of your policies. After you have figured out the different issues that you would like your policies to address, you will then have to come up with different categories for them. 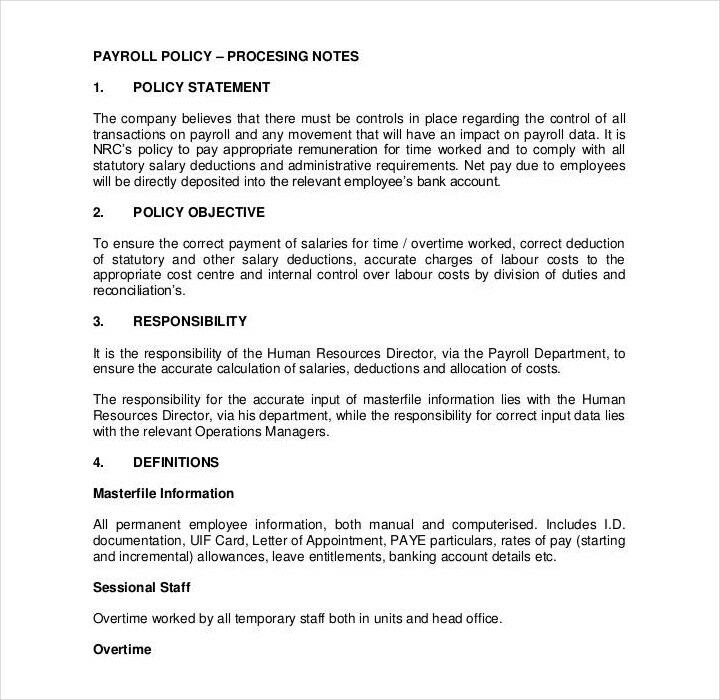 A good example would be if you have a particular set of policies that focus mostly on an employee’s payroll, then you can place this under the category of “Pay”. Policies have to be separated into categories so that they’ll be more organized and easier to access. It can also help with what you decide is more important to address, and be able to address those things in detail. 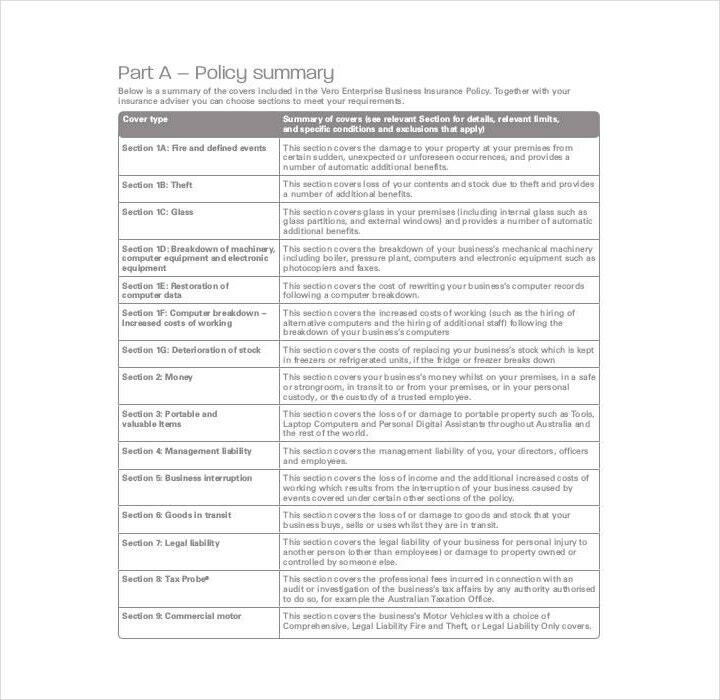 Use an outline format to detail the different policies that can be found under different categories. With the help of an outline, you’ll be able to go deeper into the aspects of these policies as well as add stipulations and specifics as you go through them. Make use of numbers to organize the different sections and categories. You must start with a brief outline, followed by writing down all of your initial ideas. After you have done that, you can go back to those sections that you would like to lengthen. Come up with the appropriate consequences should anyone in the company break a particular policy. 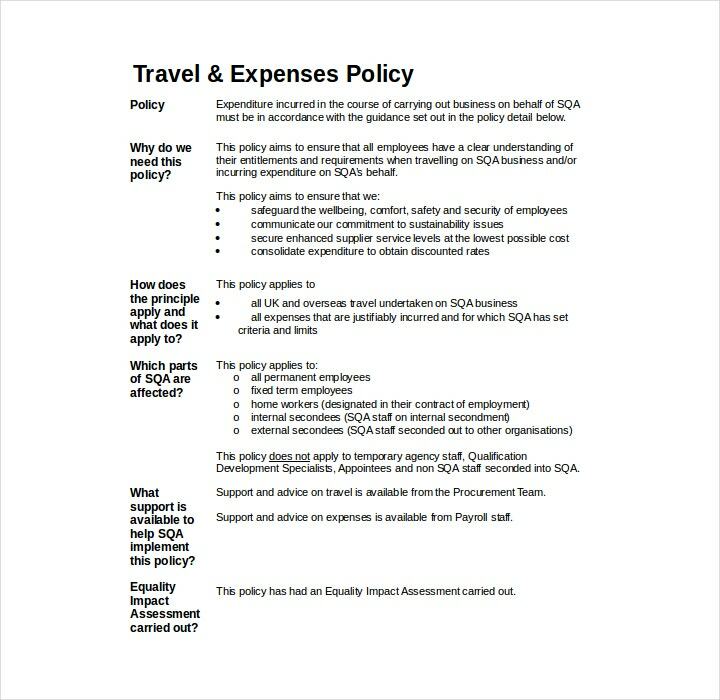 With the help of company policies, it will allow your business to run smoothly while ensuring that employees live up to certain standards. 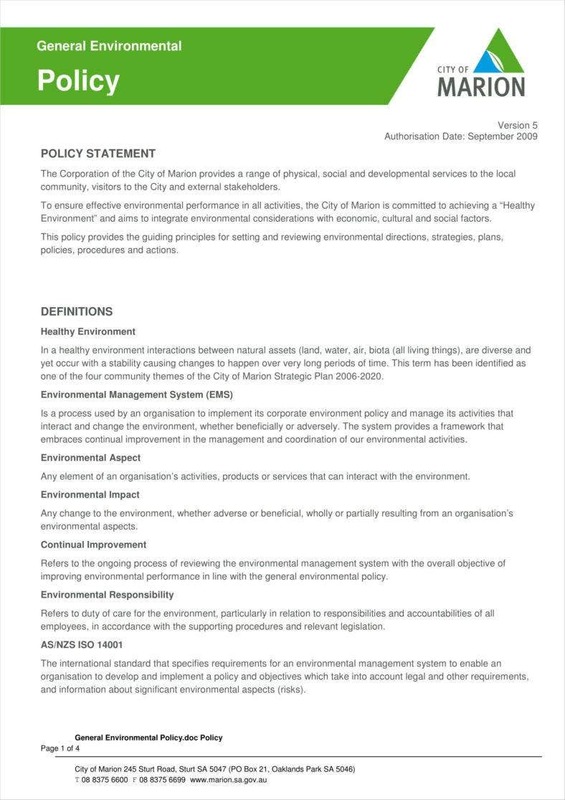 It can also serve as a written document that outlines how one should handle things in the event that a policy is broken. This is especially important for when a certain action needs to be taken in order to resolve an issue. Have a clear policy when it comes to employee termination. 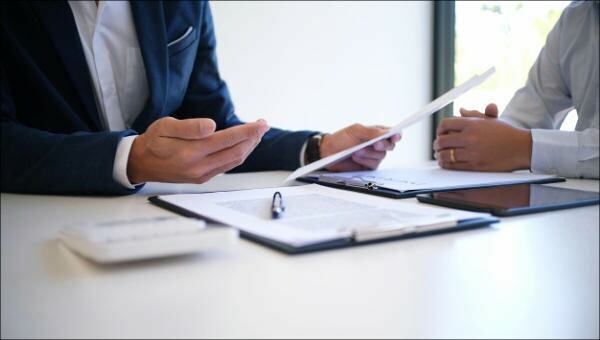 Should you ever have to fire an employee for breaking a particular company policy, the written policy will serve as evidence in the event that the terminated employee makes any sort of claim toward unfair termination. So you have to make sure that you have a policy that will lay out all the details of employee termination. Your company should have a policy with regard to hiring employees. You have to make sure that it addresses things like how management is supposed to perform background checks on applicants or require new recruits to be under a probationary status before they can be considered for permanent employment. 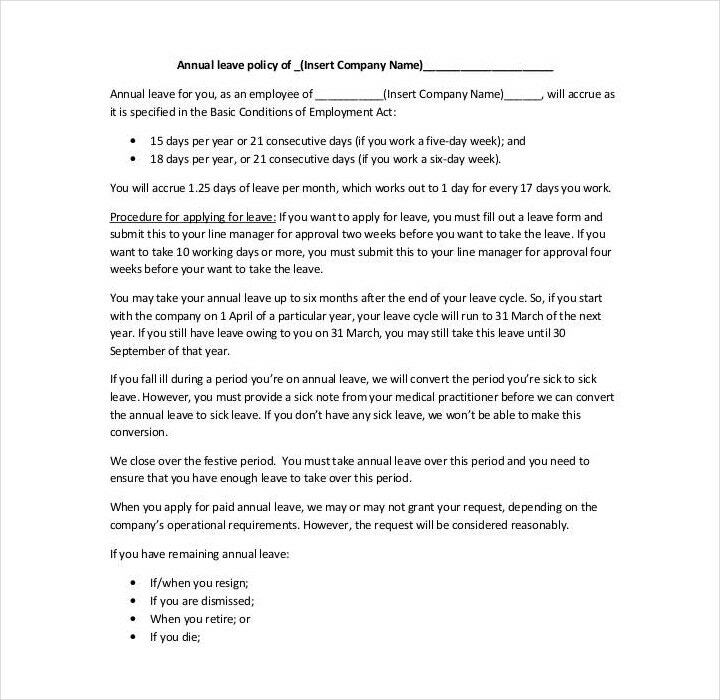 You have to set these terms clearly as this is what will determine whether you get the employees you need to bring your business forward on the path of success. Make use of clear and active language. 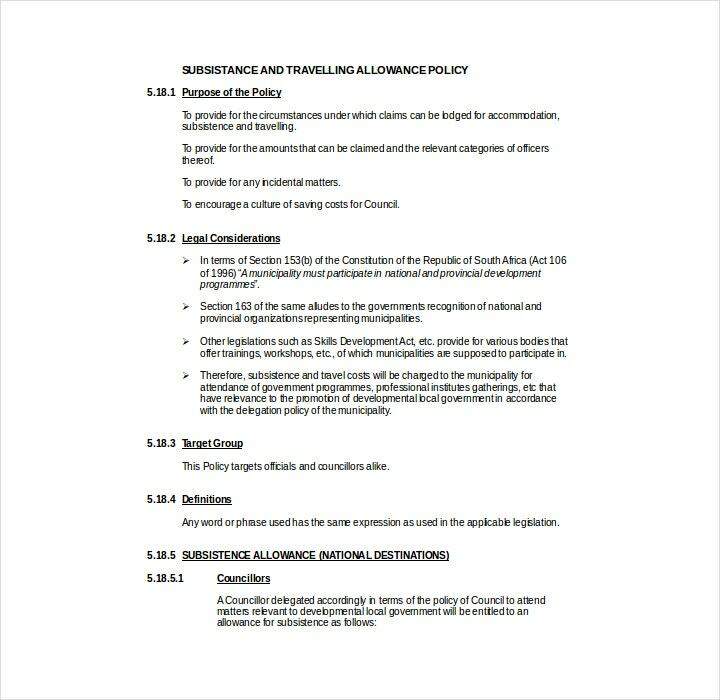 You have to write your policies in a way that there are is no room for any sort of misunderstanding or misinterpretation. In the event that one of your policies can be interpreted in any other way, you will have to fix that as soon as possible so that your employees or customers won’t end up being confused. 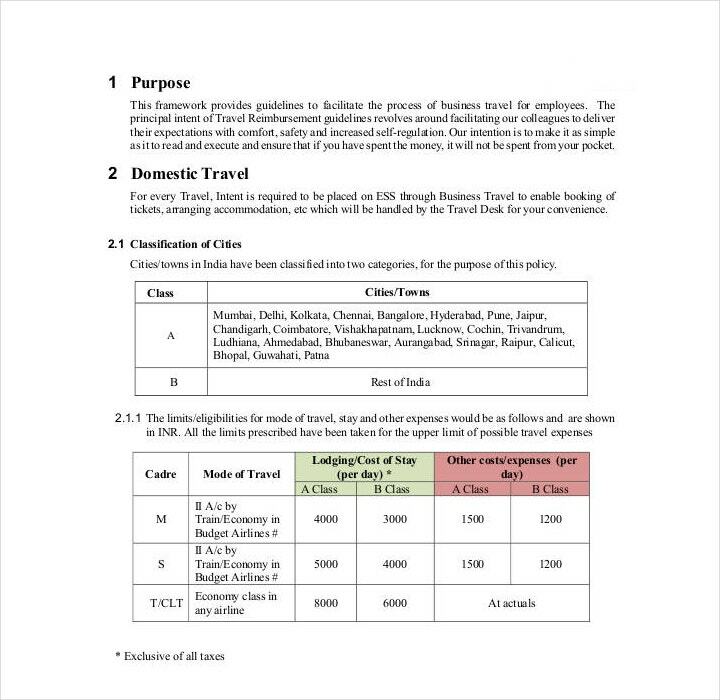 Determine which tasks in the company will require detailed procedures. Not all tasks are going to need detailed instructions. Prioritize those tasks that need to be done with consistency such as those for employee payroll. So while deciding which procedure should be outlined in detail, you’ll have to factor in things such as whether the procedure is lengthy or complex, the consequences for doing it incorrectly, if it has undergone any recent changes, etc. Collect the necessary information for each procedure. Before you’re able to detail the procedure, you’re going to have to learn every aspect of it. Consider all of the important questions that employees have raised in the past and the issues that these employees have already encountered. Once you have all of the information that you need, you’re going to want to stick with the basics when writing the procedure itself. So when writing about it, you’re going to have to think about what the reader or employee will need to understand in order to be able to properly carry out the procedure. Doing this will ensure that these procedures are followed properly and can help prevent any complications. Use all of the information to write clear procedures. Make use of an active voice when writing the procedures themselves. Trying to avoid being too wordy and make sure that you’re using a language that the reader should easily be able to understand. So make sure that you don’t use any jargon that an employee might not be able to understand. So if your procedures aren’t clear, then don’t expect any of your employees to provide you with the output that you expect. Every employer and employee knows that with good policies and procedures, a company is able to run in a way that will ensure both stability and order. So it’s important that business owners or managers know how to create these policies and procedures. 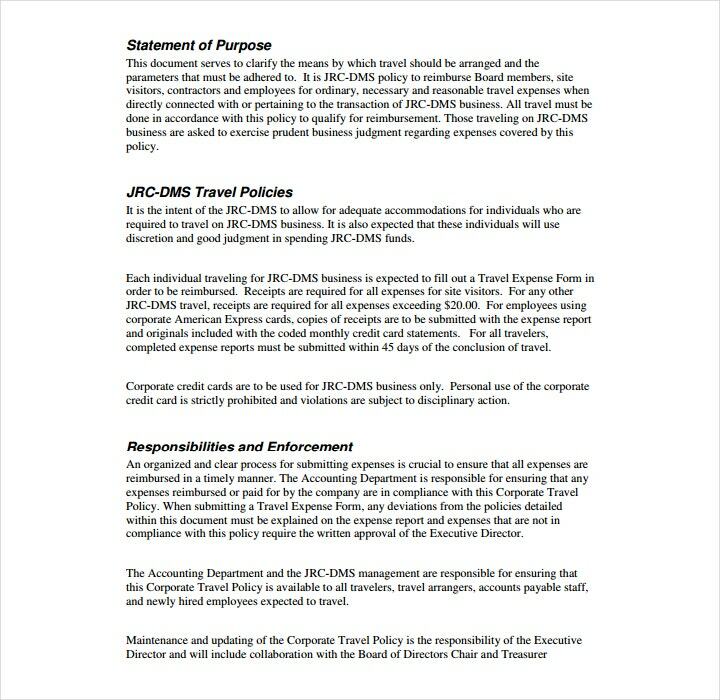 So in the event that you would like to learn more about how to write company policies and procedures, as well as find the templates that can help you write these policies, then all you have to do is go through any of our available articles.